César Franck. Six pieces in F major and F minor from the Cycle L'Organiste (Organist). Video demo: C.Franck. Pièce No.7 in F major from the Cycle L'Organiste (Organist). Video demo: César Franck. Seven pieces in F major and F minor. Video demo: A. Timoshenko. Polesskaya Rhapsody (Siberian Rhapsody). Video demo: Victor Vlasov. Odessa Rap. 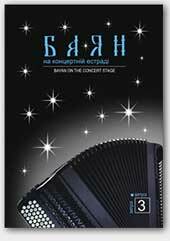 Performed by Khrystyna Andrukhiv (violin) and Iryna Serotyuk, bayan (accordion). (Attention! The pieces are played by instrumental DUO. The music sheets above are for bayan / accordion SOLO).